Living in a fairly remote part of Colorado, when my family needs to go shopping (for things Amazon can’t easily deliver) we often end up at the Cherry Creek Mall in Denver. A few weeks ago, my wife needed a few things and decided she wanted to go to Nordstrom’s. Doing my best to be a helpful husband, I offered to entertain our oldest son Lochlan (aged 2) so that my wife could enjoy some time to herself. I paused and looked around. I didn’t see any balloons. Ah, the joys of parenting a two-year-old. I did my best to distract him by walking around the store – pointing out mannequins, displays, and anything colorful that I thought he might take an interest in. I love my son, but at this point, I’m thinking he’s a bit crazy. Trying to reason with a two-year-old – who’s the crazy one now? We continued to walk around the store. I didn’t let on, but I did keep my eyes open for anything remotely resembling a balloon. It was elusive. I couldn’t find a single balloon. After about twenty minutes, we returned to the section of the department store where my wife was shopping. A smile spread across her lips, which was a combination of surprise and delight. 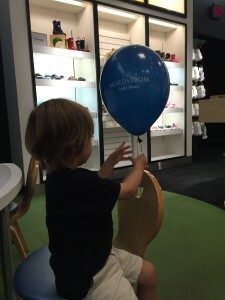 My wife explained that the last time they were in Nordstrom’s together – approximately 4 months earlier – they had visited the children’s shoe section and Lochlan got a balloon. There were no balloons to be seen. Lochlan wasn’t confused at all. “Bwue,” my son replied in his two-year-old diction. She slipped into a back room and emerged a few seconds later with a large, blue balloon. A smile spread across my son’s lips, which was a combination of surprise and delight. For years, I’ve studied and personally experienced the remarkable way that Nordstrom treats its customers. Anyone who studies customer experience is surely familiar with the great book by Robert Spector and Patrick McCarthy – The Nordstrom Way: The Inside Story of America’s #1 Customer Service Company, and many people have heard the famous tale of how a customer brought a set of snow tires into a Nordstrom location in Alaska and asked to return them. The request was smoothly and efficiently handled – even though Nordstrom has never sold snow tires. In this more recent Nordstrom experience, the staff at the Cherry Creek Mall has realized who their best customer is…The children of their shoppers. By focusing on surprise and delight for the kids, Nordstrom gets a double win. The child is content and the parent is thrilled that the child is content. Not to mention the fact that children remember these types of touchpoints even more than moms and dads. If I had to guess, the total cost to Nordstrom to have a helium tank and a ton of balloons is less than $0.10 per balloon. For that minor investment, they create a homing beacon for kids. After the first experience of receiving a balloon, every time a child returns to the mall he/she pulls their parent toward the children’s shoe section to get another balloon. The story doesn’t end with the balloon. The children’s shoe section is designed to keep kids entertained and intrigued. An enormous fish tank, coupled with colorful displays, provides a host of opportunities for engagement with a child. In addition, by creating a space in the store where children want to hang out, Nordstrom focuses the children into one area of the store – while shoppers in the rest of the store are relatively insulated from the rambunctious energy of the children. The question to ask yourself now is, “What can I do to create a moment of surprise and delight for the people who are with my customer?” Surely we want to focus on creating remarkable experiences for our customers, but the real pros go beyond that to create experiences for the people close to their customers. When My Customer is Doing Business with Me, Who Is Along for the Ride? Often, the individual doing business with you doesn’t arrive at your location alone. Whether in the presence of a child, spouse, friend, or significant other, the individual involved in the transaction is often so focused on you and your business that they aren’t paying attention to their companion(s). And neither are you. While the companion may not fit any of your pre-defined customer personas, they certainly are part of the customer experience (or lack thereof, as it may be). What is Their Experience of the Interaction? For the companions who aren’t getting your focus or attention during the sales process, what are they feeling? Do you even acknowledge their presence? Are they bored? Annoyed? Distracted? They are giving their most precious commodity (time) to wait for the transaction/interaction to conclude. What’s in it for them? Forget for a moment about doing anything to make their experience remarkable… Are you even doing anything to make it tolerable? Once you’ve identified the people with your customer and their experience of interacting with you, it’s time to figure out ways to make it better. This doesn’t require a huge investment of time or money. It does require an investment of thought and thoughtfulness. For example, I’ve been to women’s clothing stores that have a TV set up near the dressing rooms so the men who are “along for the ride” can watch TV while they wait. The same Cherry Creek Mall where the balloon experience occurred has a giant playground in the middle of the mall where weary parents can stop and let the kids run wild for a few minutes between store visits. You don’t have to invest a ton of effort – but do yourself a favor and think beyond the standard stack of expired magazines and broken or dirty toys in the waiting room. In the end, I’m certainly not advising everyone to have balloons at their office. But then again, who doesn’t wanna balloon? I’m constantly looking for examples of how organizations take care of the people who are involved in the transaction but aren’t the actual customer. If you experience this or you create something like this in your business, please take a moment to share it with me as I’d love to consider it for future presentations and articles.